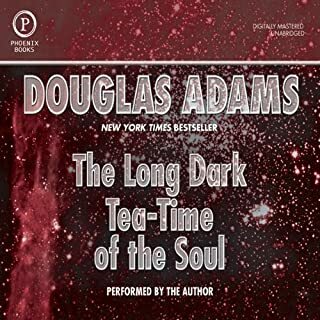 Would you try another book from Douglas Adams and/or the narrators? I have read all of the Douglas Adams books from when they were first published. Would you ever listen to anything by Douglas Adams again? Yes and No. I greatly enjoyed the Hitchhilers Guide to The Galaxy and have don since its first publishing. It is part of my education. I was hoping that Stephen fry was going to do more of the narration but sadly not the case. Do you think The Salmon of Doubt needs a follow-up book? Why or why not? This is the final of the printed works of Douglas Adams. It is a collection of the newspaper columns and thoughts on a disparate topics. Fast forward through the introductions. They are the friends of Douglas Adams telling us what a talented author and great guy he was. While these were great words for his funeral they add nothing to the otherwise great collection of the thoughts of Douglas Adams. I particularly love the definition of what it takes to ignore someone. I thoroughly enjoyed this book, even though it leaves you dangling. I had only known Adams for his novels and enjoyed seeing his other sides. The book loses a star for its inadequate description. It consists of an anthology of columns articles and notes by Adams with added eulogies. It includes a brief hitchhikers piece (Young Zaphod plays it safe, which I think was published before) and half of a Dirk Gently novel (i.e. the novel ends abruptly half way through). If you are looking for hitchhikers material (as the title implies) you may be disappointed, but finding myself a kindred spirit to Douglas I was happy with it. This book is a fantastic collection of writings of the late, great, Douglass Adams. It should be noted, however, that the Salmon of Doubt (the work this collection gets its name from) was cut short when Adams unexpectedly passed away. If you want a collection of writings on science, technology, religion, Adams' life and a bit of fiction as well as a snapshot of Adams' final work, then this collection is for you. However, if you are looking for a full story for Salmon of Doubt, you won't find it here. 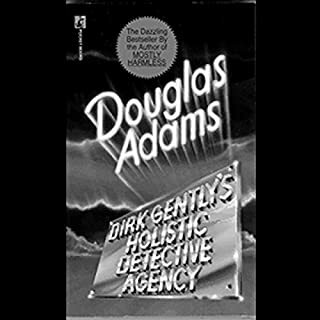 Adams' unexpected end brought an end to his final Dirk Gently novel, and we will never know whether he would have finished it out as is, or transformed it into the 6th Hitchiker's Guide to the Galaxy book. What made the experience of listening to The Salmon of Doubt the most enjoyable? All of this stuff was collected by his wife and closest friends off his hard drive and lovingly put together into one final book including the first few chapters of a Dirk Gently book. If you are a fan of his books The Salmon Of Doubt Lets you meet him in person and get to know him in an amazingly amusing way. What an amazing life and a great loss. I will always wonder where that last novel would have taken me however after reading this I kinda like it that way. I think it was his way of getting the last laugh by making us all think about his unfinished last story and smile from time to time. I lovely summation of Douglas Adams, his life and his way of thinking. RIP Douglas. Consists mainly of a hodgepodge of Adams' speeches, articles and interviews, with far too much repetition. Douglas Adams makes for some awkward situations. My review title may be a bit strange, but I really mean it. This book made me laugh loudly on public transport, making several people stare at me, but I don't care. This book is full of Adams's clever writing, and the other contributors to the book also produced some amazing text wizardry. Douglas himself. Hearing people like Steven Fry and Richard Dawkins describe him, gave me a great sense of what a great man (in more than one sense) he was. The nerator of the main story, Simon Jones, also narrates all of Dan Arielli's books, which I really enjoyed. Id made me lmao, as chatters would say, although it also made me sad that a man with such a great mind had to leave us so early. Obviously this is a mixed bag of interviews, essays, magazine pieces and leftover things. Some of it is not great, but much of it sparkles with Adams's trademark wit. There is some priceless stuff here which as a longtime Adams devotee I am so happy to have. The narrator was great. He was completely genuine in delivering interview transcripts as if he were speaking the words fresh from his own mind. A must have for Douglas Adams fans. A glimpse into what was and what might have been. So long and thanks for all the laughs. more a good tribute to adams, thats ok but its not decribed as such. there is about a hour of material and its such a shame it wasnt made into i finished book. the tributes are good though and i would recommend it. just be nice to know what your buying. Sequels to THHGTTG seek, not too successfully, to expand upon the 70's mindset of Adams. This book gives a hint towards what Adams himself would have done. His humour had definitely moved on and showed his obsession with the frustrations of computers (although he was obviously an Apple bore). I'm sure this would have fed into a sequel to keep the franchise fresh. As the blurb points out, this is a collection of bits & pieces taken from letters, magazine articles etc and therefore is best listened to in small parts. It's rather odd that Simon Jones is now the voice of Douglas Adams, but it's very fitting and evokes the unique atmosphere of Adams' humour in the character of Arthur Dent. I'd have given it 5 points but for the misleading impression that there is more than one narrator. There isn't. Dawkins, Fry & Cerf, however, do provide amusing introductions to the book. 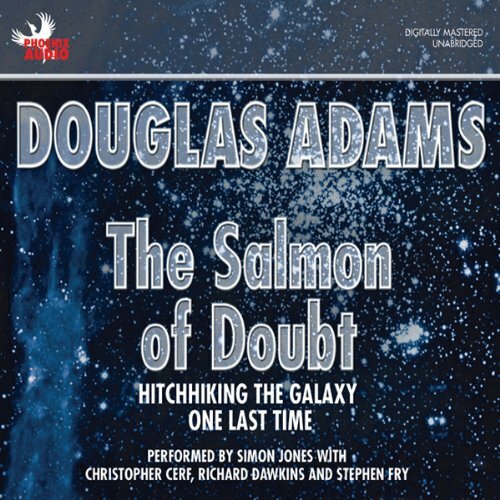 Being a collection of old letters, notes, lectures and unfinished stories, The Salmon Of Doubt feels a little like a wake for the late Douglas Adams. But if it is a wake, it's a knees-up, jolly Irish style remembering and celebration of his life and work. Needless to say, his wit, intelligence and knack for story writing shines through here, despite the longing for more when the audiobook comes to a close. Simon Jones (Arthur Dent in the radio and TV Hitchhikers series) does a good job of portraying Adams in his notes and interviews, though maybe less so as some of the characters in the later stories. That's no fault considering the wide range of characters he has to contend with here. Despite this, it's a highly recommended listen even if, like me, you've previously read the book several times. If that friend loved the work of Douglas Adams, I absolutely would. Possibly not for the unfinished quality of the Dirk Gently story included, but more for the wonderful collection of articles and thoughts that take up the first few hours. There are some real gems in there that any fan of Adams needs to read. 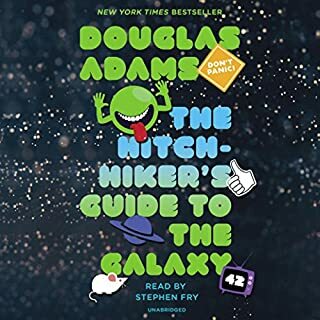 They contain his thoughts on a variety of subjects and every single one of them has that unmistakable Douglas Adams touch that simply no other author could have. Noone will make you look at Bach, The Beatles or exciteable dogs the way Adams does. Each little snippet of thought in the collected material from the harddrive of Douglas Adams is like a friendly wave from a long lost friend. 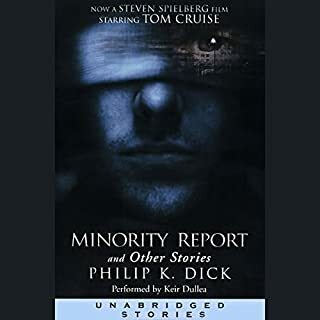 He left us far too soon and it's such a wonderful thing to have all these articles of writing together in one great audiobook. Many of these collected works had me giggling my head off in public places, just as the Hitchhiker books did. It was a real pleasure to read them all. Simon Jones is literally the only person who I see as Arthur Dent. Not only that, but he was also one of Adams' friends and worked with him closely, so if anyone has the ability to read these things how they should be read, it's him. He does a wonderful job and I am looking forward to visiting this book again in the future. I wouldn't. because films that aren't done by the bbc have a history of screwing up his work. Leave it alone, damn it! 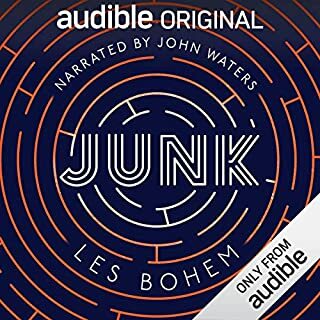 This audiobook is just all kinds of wonderful. I grew up listening to the hitchhikers radio plays and the books as well. I and my friends could quote them word for word in some places, so for me this is a wonderful treasure and I am so glad it was performed so brilliantly in audio. Thank you! This book told me a lot about Douglas Adams and what he did in his daily life. Well, it's not done, as expected, but it's entertaining none the less. If you like Douglas, this is for you. Something of a hotch-potch of uncompleted work-in-progress tales. But each has its own Adams fun--after all, who needs a middle and an end to An Adams yarn? As a great Douglas Adams fan this book is a gift . It takes the unpublished writings from after his tragic demise and has them beautifully read by people who ,as well as being significant in his life ,also have wonderful reading voices. The articles,speeches ,unfinished books and stories within show how much more we could have looked forward to if Douglas Adams hadn't passed away. I have always been a huge Douglas Adams fan. This compilation of his various writings and the unfinished book, with all the wonderful readers was a real listening pleasure. Highly Recommended. Adored it and shall again I'm sure. Never is once enough. Has The Salmon of Doubt put you off other books in this genre? I don't know what this is about, it is boring and I'm returning it. I loved the earlier books.